Now, dental implants have become one of the most preferred solutions to replace missing teeth. In fact, more than 500,000 are placed every year with that number growing annually. While they have only recently gained traction in popularity, they have an extensive history. In fact, their use dates back all the way to 2000 BC. While the first ones were used after death, the advancements over the generations have led them to become the most predicable and reliable option to replace missing teeth today. Civilizations in ancient China around 2000 BC had carved bamboo pegs to replace missing teeth. However, it was not until 1000 BC when the first recorded case of metal was used. An Egyptian king at the time was found with a copper peg hammered into his jaw. While it remains unknown if this was done while he was alive or after death, it is the first use of a metal dental implant. This is not the only instance in history where metal had been used. In fact, in an uncovered Celtic grave in France, which dates back to around 300 BC, archaeologists found a false tooth that was composed of iron. It is believed that it was used for aesthetic purposes after death because the process to place it at the time would have caused excruciating pain. Over the years, archaeologists have continued to unearth various prosthetic teeth that are made from common materials, like jade. It was not until the 18th century when researchers began to use gold and alloys to make the prosthetic teeth; however, they did not offer a very successful solution. In 1952, an orthopedic surgeon accidently came across the use of titanium, which allowed the procedure to be viewed as a potentially viable option. While placing a titanium cylinder into a rabbit femur bone, he found that the body naturally fused to the material. Using this knowledge, another orthopedic surgeon successfully placed the first dental implant in 1965. As time has gone on, several advancements have been made to make the procedure the most successful solution to treat tooth loss. Now, you get to witness history in the making of dental implants as new materials have led to their everyday use. Although dental implants have only recently gained in popularity, the theory behind them is quite extensive. Over the years, the procedure and materials used have been perfected to allow them to offer over a 95% success rate. Now, you can treat your tooth loss with an option that has the potential to last for a lifetime. 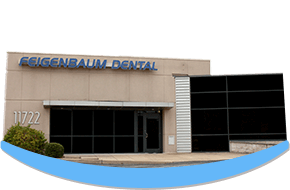 Feigenbaum Dental is committed to creating beautiful smiles with a gentle touch. With the skills and qualifications of Dr. James Feigenbaum and Dr. Jenna Feigenbaum, you will enjoy the most advanced services to promote your oral health. Using state-of-the-art technology and proven methodologies, they provide many areas of dentistry, including dental implants. If you are interested in replacing your missing teeth, contact Feigenbaum Dental today to schedule a consultation to discuss your options for a complete smile.